There are few places in the world with a view as panoramic, historic, and artistic as the Piazza San Marco in Venice, Italy. St. Mark’s Square as it is commonly known is probably the best place to stand in one place and take many pictures for your “I went to Venice” picture album. Among many other buildings you will see the Doge’s Palace, the Basilica of San Marco, the Museo Archaeological, Museo Correr, and the Bell tower. Do the full circuit taking pictures and notice others doing the same, it’s expected. It was begun in the 9th century and expanded to what it is now in the 12th century. Take in the history; enjoy the sounds of Italy without the drone of cars or cycles. Someone, either Napoleon or Alfred de Musset said that St. Mark’s Square was “Europe’s drawing room.” It is a place to mingle and mix with many. Several cafés are located around the square, so order a cup of coffee and sit for a while. 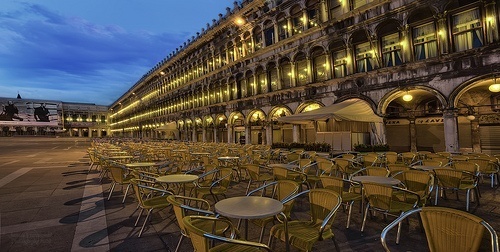 At night, there are classical musicians performing in Piazza san Marco for free. Watch others enter and do the 360° circuit taking pictures, watch strangers and lovers meet, you can even watch the gondolas, but don't feed the pigeons which populate the square. This square has housed emperors, religious figures, festivals and even executions. Add to the history by just being there, being in Venice. Last updated by Tracy Huddlestun on 27 May, 2012 in Destinations.